Captain Myles Moylan testified to the casualties in his troop on the first day of the Wounded Knee investigation. Moylan was mistaken in his testimony, as he recorded a week earlier in his company muster roll that five of his troopers were killed in action and one died of wounds. Of those five, four were killed by gunshots to the head, and likely were shot while preventing the Indians from escaping west in the dry ravine. All of them were foreign born soldiers. Writing to the Adjutant General in 1893 in support of an award recommendation, Colonel James Forsyth described the action in the ravine that resulted in the deaths of at least three of A Troop’s soldiers. A line of sentinels were thrown around the Indian village, behind which ran a deep ravine. Capt. Garlington [then first lieutenant] was in command of a small portion of this line, and in order to prevent escape into the high grass up this ravine leading into the foothills he ordered his party, in case the Indians made a break, to immediately gather behind the cut banks of a road crossing the ravine and to hold it at all hazards…. 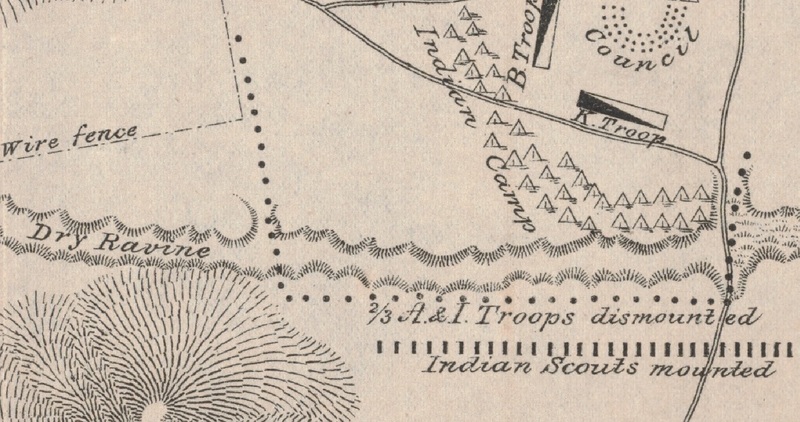 There was gathered with him there one officer, four noncommissioned officers, and five privates, but the shelter behind the banks of the road was of such a character that only about four men at a time could avail themselves of it and fire, whilst every time they fired they were partially exposed…. Garlington received due recognition for his actions that day, and history records his name and deeds. But, who were the other members of his party in the dry ravine that fed into the Wounded Knee Creek? Likely four of them were immigrant soldiers of A Troop that died of gunshot wounds to the head. 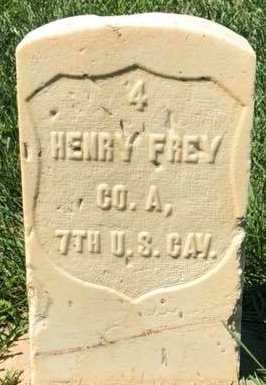 Switzerland native Saddler Henry Frey’s final resting place is at the Fort Riley Post Cemetery. Two months shy of his twenty-seventh birthday, Henry Frey enlisted in the army at Detroit, Michigan, on 16 June 1890. Born around August 1863 in Schaffhausen, Switzerland, Frey stood just over five feet four inches tall and had a light complexion with blue eyes and light brown hair. His civilian occupation of harness maker suited him well to serve as the Saddler of A Troop. He had been in the Army just over six months and in the regiment less than three. Frey was twenty-eight and unmarried when he was killed at Wounded Knee. History records little else of the Swiss saddler, who he counted as his friends and family, or when he left his homeland and came to America. Like most of his fellow troopers killed that day, Frey was initially buried in the Episcopal Cemetery at the Pine Ridge Agency on New Years Eve, 1890, and was later re-interred at the Fort Riley Post Cemetery in October 1906. 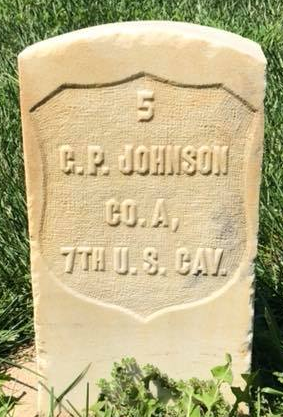 German native Private George P. Johnson is buried in the Fort Riley Post Cemetery. George P. Johnson was twenty-two when he enlisted at Chicago, Illinois on 6 August 1887. He was born in the town of Svanninge, Germany, now part of Denmark. He was a teamster just under five and a half feet, had blue eyes and brown hair, and was fair complected. Having served almost three and half years of his five-year enlistment, Johnson was a twenty-five-year-old private in A Troop when he was killed at Wounded Knee. He too was laid to rest in the Pine Ridge Cemetery and later disinterred and reburied at Fort Riley. Unlike most enlisted soldiers of the day, Johnson was married. His wife, Matilda, likely still living at Fort Riley filed for a widow’s pension the following April. 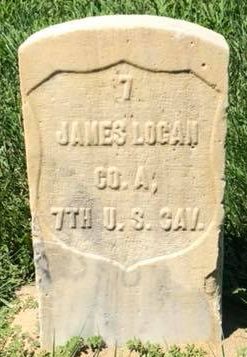 English native Private James Logan is buried at the Fort Riley Post Cemetery. James Logan was a twenty-four-year-old laborer born in Lancashire, England, when he enlisted at Newark, New Jersey, for five years on 21 August 1888. He was just over five feet and eight inches tall and had a fair complexion, blue eyes, and light hair. Logan had been sick in quarters at Pine Ridge with a boil on his right thigh, but was apparently well enough to join his troop on 26 December when they departed for the Wounded Knee Creek Post Office in pursuit of Big Foot’s band. Initially buried along side of his fellow troopers at Pine Ridge, his remains also are now at Fort Riley. Like Johnson, Private Logan was one of the few enlisted soldiers that was married. His wife, Mary, filed for a pension the following March from the state of Massachusetts. James and Mary Logan also had a child whose name is unrecorded. A guardian, Arba N. Lincoln from Fall River, Massachusetts, filed for a pension on behalf of the child eleven years after Private Logan was killed. 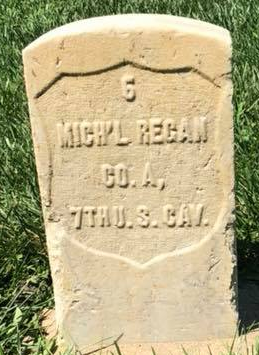 Ireland native Private Michael Regan is buried in the Fort Riley Post Cemetery. The final trooper that Captain Moylan recorded as “killed by ‘gunshot wound of head’” was twenty-eight-year-old Michael Regan, a carpenter from Sligo, Ireland. He enlisted at Brooklyn, New York, on 18 September 1890. He stood five feet eight inches tall, had blue eyes, brown hair and a sallow complexion. Regan had been in the Army just over three months and with the regiment barely three weeks. He was one of nine new recruits that joined A Troop at Pine Ridge on 6 December. Like the other troopers killed in the ravine at Wounded Knee, Private Regan was buried at Pine Ridge and later re-interred at Fort Riley. Regan’s mother, Elizabeth, still living in Ireland, filed for a pension on 21 November 1891. National Archives, “Sioux Campaign, 1890-91,” 664 – 665 (Moylan’s testimony dated 7 Jan 1891); Adjutant General’s Officer, “7th Cavalry, Troop A, Jan. 1885 – Dec. 1897,” Muster Rolls of Regular Army Organizations, 1784 – Oct. 31, 1912, Record Group 94, (Washington: National Archives Record Administration). Ancestry.com, U.S. Army, Register of Enlistments, 1798-1914 [database on-line], Provo, UT, USA: Ancestry.com Operations Inc, 2007; Adjutant General’s Office, Final Statements, 1862-1899 at Fold3, http://www.fold3.com/image/1/271303441/ accessed 26 Aug 2013; National Archives and Records Administration, Burial Registers of Military Posts and National Cemeteries, compiled ca. 1862-ca. 1960, Archive Number: 44778151, Series: A1 627, Record Group Title: Records of the Office of the Quartermaster General, 1774-1985, Record Group Number: 92. Ancestry.com, U.S. Army, Register of Enlistments, 1798-1914 [database on-line], Provo, UT, USA: Ancestry.com Operations Inc, 2007; Adjutant General’s Office, Final Statements, 1862-1899 at Fold3, http://www.fold3.com/image/1/271303460/ accessed 26 Aug 2013; National Archives and Records Administration, Burial Registers of Military Posts and National Cemeteries, compiled ca. 1862-ca. 1960, Archive Number: 44778151, Series: A1 627, Record Group Title: Records of the Office of the Quartermaster General, 1774-1985, Record Group Number: 92; National Archives and Records Administration, U.S., Civil War Pension Index: General Index to Pension Files, 1861-1934 [database on-line], Provo, UT, USA: Ancestry.com Operations Inc, 2000. Ancestry.com, U.S. Army, Register of Enlistments, 1798-1914 [database on-line], Provo, UT, USA: Ancestry.com Operations Inc, 2007; Adjutant General’s Office, Final Statements, 1862-1899 at Fold3, http://www.fold3.com/image/271303477/ accessed 26 Aug 2013; National Archives and Records Administration, Burial Registers of Military Posts and National Cemeteries, compiled ca. 1862-ca. 1960, Archive Number: 44778151, Series: A1 627, Record Group Title: Records of the Office of the Quartermaster General, 1774-1985, Record Group Number: 92; Adjutant General’s Officer, “7th Cavalry, Troop A, Jan. 1885 – Dec. 1897,” Muster Rolls of Regular Army Organizations, 1784 – Oct. 31, 1912, Record Group 94, (Washington: National Archives Record Administration); National Archives and Records Administration, U.S., Civil War Pension Index: General Index to Pension Files, 1861-1934 [database on-line], Provo, UT, USA: Ancestry.com Operations Inc, 2000. Ancestry.com, U.S. Army, Register of Enlistments, 1798-1914 [database on-line], Provo, UT, USA: Ancestry.com Operations Inc, 2007; Adjutant General’s Office, Final Statements, 1862-1899 at Fold3, http://www.fold3.com/image/271303525/ accessed 26 Aug 2013; National Archives and Records Administration, Burial Registers of Military Posts and National Cemeteries, compiled ca. 1862-ca. 1960, Archive Number: 44778151, Series: A1 627, Record Group Title: Records of the Office of the Quartermaster General, 1774-1985, Record Group Number: 92; Adjutant General’s Officer, “7th Cavalry, Troop A, Jan. 1885 – Dec. 1897,” Muster Rolls of Regular Army Organizations, 1784 – Oct. 31, 1912, Record Group 94, (Washington: National Archives Record Administration); National Archives and Records Administration, U.S., Civil War Pension Index: General Index to Pension Files, 1861-1934 [database on-line], Provo, UT, USA: Ancestry.com Operations Inc, 2000. 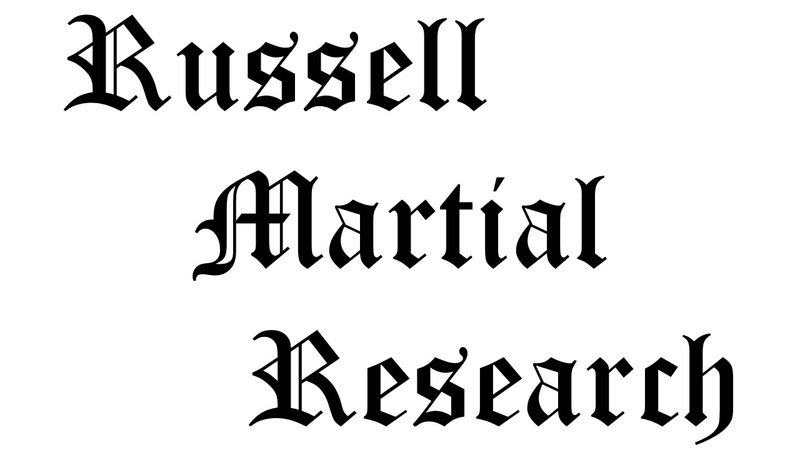 Citation for this article: Samuel L. Russell, “Immigrant Soldiers – Saddler Frey and Privates Johnson, Logan, and Regan, A Troop, 7th Cavalry – Killed by Gunshot Wounds to the Head,” Army at Wounded Knee (Sumter, SC: Russell Martial Research, 2013-2015, http://wp.me/p3NoJy-as), Published 23 Sep 2013, accessed date ________. This entry was posted in Casualties, Enlisted and tagged 7th Cavalry, 7th Cavalry Regiment (United States), Big Foot, Cavalry, Ernest Garlington, Fort Riley, Miniconjou, Myles Moylan, Oglala Lakota, Pine Ridge Agency, Pine Ridge Indian Reservation, Sioux, Wounded Knee, Wounded Knee Creek, Wounded Knee Massacre. Bookmark the permalink. Colonel Russell, I am interested in corresponding with you concerning Corporal John A. Bailey of B Troop, 7th Cavalry. He died in St. Paul in 1915 and is buried in Fort Snelling National Cemetery here in the Twin Cities. Thanks. Mr. Chicoine… Thank you for the comment. The information I have on Bailey of B Troop at the time of Wounded Knee is what is recorded in the company muster roll: “Saddler Bailey, John A.: Enlisted on Jan. 5, 86 at Fort Yates, Dakota Territory, by Lt. Mann.” I’d be happy to correspond with you on any information you may have regarding this soldier. I had read and reread the many stories of Wounded Knee and the Battle of Little Big Horn and they vary in some difference by different authors. I know that there were immigrants that did indeed join George Armstrong Custer and had taken part in the wars against the Sioux. What I am seeking is the name of this immigrant man from Newfoundland, Canada who had joined the 7th Calvary of Custer and had been a soldier. I am a bit of an historian and heard that there was such a young man from Newfoundland of Eastern Canada. I had heard that Reader’s Digest had written a story of the 7th Cavalry and this man’s name and where he was from. Had heard he was from Bonavista, Newfoundland. Thanks in advance.